Compared with adults, fractures of the facial bones and mandible are uncommon in the pediatric age group, particularly those patients younger than 5 years. The impact of craniofacial trauma is minimized by the reduced inertia, due to the light weight and small size. The force of impact is absorbed by the forehead and the skull rather than the face since the ratio of cranial volume to facial volume is greater in children than adults (8:1 at birth, 4:1 at 5 years vs. 2:1 in adults). Besides, pediatric facial bones are more resistant to fractures due to their higher elasticity, poor pneumatization (by sinuses), thick surrounding adipose tissue, and stabilization of the mandible and maxilla by the unerupted teeth. Excluding the nasal bones, the mandible is the most frequently fractured facial bone in the pediatric patient. One third of pediatric trauma patients with facial fractures have a mandibular fracture. The mandible is different from other facial bones in some important respects. In addition to its contribution to facial dimension and symmetry, the mandible has unique and important functional features. The mandible is the only bone in the face that moves in relation to the skull. Additionally, the mandible bears powerful muscular stresses; injury to this bone can be functionally disabling. Treatment of certain fracture types differs from treatment of similar fractures in adults and depends on the stage of developing dentition of the pediatric patient. For excellent patient education resources, visit eMedicineHealth's Oral Health Center. Also, see eMedicineHealth's patient education articles Broken Jaw and Broken or Knocked-out Teeth. In several series, motor vehicle accidents and falls are the most common causes of pediatric mandibular fractures. However, the frequencies of etiologies of fractures in a Swiss series were 72% due to recreational activities and 17% to traffic accidents. Thoren's 1992 series reports 57% of fractures were due to vehicular accidents and another 18% to falls. The vast majority of the vehicular accidents are attributed to bicycle accidents. Some discrepancy in reported causes exists because some studies classify falls from a bicycle as falls and others classify this type of accident as a vehicular accident. Older school-age children also sustain injuries in sporting activities, while teenagers, like adults, are frequently subject to violent causes of injury. During the first years of life, the size and proportions of the facial skeleton change markedly. The facial skeleton increases in relation to the rest of the head, and the sinuses and dentition develop postnatally. 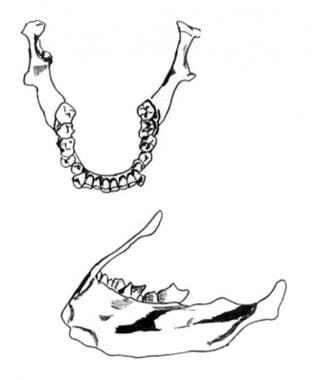 The mandible is relatively small at birth and grows by remodeling. The eruption of teeth and the development of the alveolar process also contribute to vertical growth. Apposition of bone at other surfaces causes the bone to develop a more adult shape. Thus, the mandible assumes a more forward position and a longer shape. The condylar growth centers are crucial in mandibular development. Each center consists of chondrogenic, cartilaginous, and osseous zones. A thin vascular layer covers the chondrogenic zone. Bone is deposited at the posterior borders of the rami and condyles. Trauma to the growth center just beneath the articular disk is cause for concern. Delayed growth on the affected side can cause facial asymmetry, mandibular deviation, and malocclusion. A high tooth-to-bone ratio exists in the pediatric bone. Fractures frequently occur through developing tooth crypts. Teeth in the line of fracture may develop with malformations. Teeth begin to erupt at age 6 months, and the full complement of 20 primary teeth is erupted completely at about age 2 years. These teeth are relatively stable until age 6 years when root resorption begins to occur, which causes the teeth to loosen. Permanent dentition erupts, beginning with the first molars and central incisors, at ages 6-7 years. The second molars erupt at age 12 years. Because the young patient has a high ratio of cancellous to cortical bone and a thick layer of soft tissue covering, greenstick fractures are common. Rapid healing occurs in pediatric bone, and the best reduction is obtained within 5 days. However, if callus is already formed, a slight discrepancy in primary occlusion is acceptable. Some degree of functional remodeling can be anticipated. Do not neglect a complete trauma evaluation. Children with mandibular fractures are at risk for airway compromise because of the direct trauma, swelling, or hematoma that causes obstruction or impaired consciousness. Often, airway management may be accomplished with positioning. However, presume cervical spine injuries until excluded. Suction the oropharynx of debris and blood as necessary. Fractures of the mandibular arch may allow a bony segment to be displaced posteriorly. Manual traction or a traction stitch on the tongue may alleviate airway obstruction. If necessary, orotracheal intubation is usually possible and preferable to an emergent surgical airway. Quickly accomplish control of hemorrhage because the blood volume in the child is small. Perform a thorough trauma physical examination. The youngest patients are unable to provide a history, and slightly older children are limited by descriptive ability, fear of the situation leading to the trauma, as well as anxiety in the hospital setting. The patient may report pain in the jaw region, particularly upon movement. Minor displacement leads to noticeable changes in occlusion. Ask patients whether their bite feels normal. Young patients are more difficult to examine. Inspect the face first and note obvious asymmetry. Swelling and ecchymosis of the face, especially the preauricular areas, may be clues to underlying fractures. A chin laceration on the young child usually indicates a superiorly directed midline force, which often results in condylar damage. Examination of the jaw during mouth opening and closing may reveal deviation of the jaw or limited mobility. Trismus may also be evident after a mandibular fracture and is commonly due to muscle spasm and pain. However, restriction of jaw motion may be secondary to a displaced zygomatic fracture impinging on the coronoid process of the mandible. Intraoral examination may reveal lacerations or hematomas. If bone is exposed through an intraoral or cutaneous laceration, antibiotics are indicated. Penicillin covers most mouth flora. A first-generation cephalosporin covers most skin flora. Examination of teeth for injury also is important. Rapid treatment of dental injuries, especially of the permanent dentition, is essential. Examination of the ear may also be rewarding. Fractures of the condyle can cause bleeding or ecchymosis of the anterior wall of the external auditory canal. Next, perform orderly palpation of the facial skeleton. Step-offs and instability may be apparent. Bimanual examination of the mandible may be helpful. Palpation in the auditory canal during movement of the jaw may reveal crepitation or evidence of a displaced condylar head. A fracture of the body of the mandible may affect the inferior alveolar nerve, leading to numbness of the teeth or chin. Displaced fractures may also affect the lingual nerve, which innervates the anterior two thirds of the tongue, or they may affect the long buccal nerve, which supplies sensation to the cheek mucosa and corner of the lip. Assessment of occlusion is more difficult in the child than in the adult. Children often do not have a full complement of teeth. Knowledge of pretraumatic occlusal status is important in evaluation and treatment. In adults, wear facets are useful, particularly when other serious injuries are present. In children, dental wear may not be apparent. Mandibular fractures carry the highest rate of associated injuries in pediatric patients with facial fractures. In Kaban's 1977 series,  22 of 29 pediatric patients with mandibular fractures had other injuries, mostly confined to the head and face, which included 1 cervical spine injury. In 1992, Thoren reported associated midface fractures in 8% of patients, most of these in patients aged 13-15 years. Skull fracture or cerebral injury occurred in 13% of patients, and orthopedic injuries occurred in 8%. Indications for jaw immobilization are bilateral fractures with an open bite or severe movement limitation or deviation. See Surgical therapy for a discussion of the indications for surgical therapy in each type of mandible fracture. Patterns of fracture distribution are affected by the force and direction of impact as well as the state of mandibular development of the child. The younger child has relatively more soft tissue cushioning, and the mandibular bone is in a more protected position. The overall force developed in most childhood falls is low. Also, in young children the bone is relatively resilient; therefore, force directed at the chin is transmitted to the condylar heads, which sustain a crush-type injury. In Thoren's 1992 study,  the condylar region was the most common location of fracture in all pediatric age groups, accounting for 60% of all fractures; 72% of children had fractures in this region. In a 1993 series reported by Posnick,  most mandibular fractures occurred at the condyle (55%), followed by the parasymphysial region (27%), then the body (9%), and angle (8%). As the age of the patient increases, the relative number of condylar fractures decreases, while fractures in the body and angle increase. Patients aged 10 years and older are similar to adults in cause and fracture pattern. While most children have only 1 mandibular fracture, approximately a third have 2 or more fractures. Fractures at multiple sites occur in approximately 40-60% of the cases and are more common among children older than 13 years of age (59% vs 35%). Fractures of the mandible may also be classified as favorable or unfavorable, in both the horizontal and vertical directions, depending on whether the inherent muscular pull tends to reduce or displace the fractured segments. In contrast to adult patients, surgery is not indicated in the vast majority of pediatric patients with condylar fractures; they may be treated nonoperatively. Usually, these patients have normal occlusion and range of motion. Also, conservatively manage comminuted fractures of the head and condyle. Zhou H, Lv K, Yang R, Li Z, Li Z. Mechanics in the Production of Mandibular Fractures: A Clinical, Retrospective Case-Control Study. PLoS One. 2016. 11 (2):e0149553. [Medline]. MacLennan WD. Fractures of the mandible in children under the age of six years. Br J Plast Surg. 1956. 9:125. Rowe NL. Fractures of the jaws in children. J Oral Surg. 1969 Jul. 27(7):497-507. [Medline]. Thoren H, Iizuka T, Hallikainen D. Different patterns of mandibular fractures in children. An analysis of 220 fractures in 157 patients. J Craniomaxillofac Surg. 1992 Oct. 20(7):292-6. [Medline]. Ul Haq ME, Khan AS. A retrospective study of causes, management, and complications of pediatric facial fractures. Eur J Dent. 2018 Apr-Jun. 12 (2):247-52. [Medline]. [Full Text]. Ghosh R, Gopalkrishnan K, Anand J. Pediatric Facial Fractures: A 10-year Study. J Maxillofac Oral Surg. 2018 Jun. 17 (2):158-63. [Medline]. Siwani R, Tombers NM, Rieck KL, Cofer SA. Comparative analysis of fracture characteristics of the developing mandible: the Mayo Clinic experience. Int J Pediatr Otorhinolaryngol. 2014 Jul. 78 (7):1066-70. [Medline]. Swanson EW, Susarla SM, Ghasemzadeh A, et al. Application of the Mandible Injury Severity Score to Pediatric Mandibular Fractures. J Oral Maxillofac Surg. 2015 Jul. 73 (7):1341-9. [Medline]. Kaban LB, Mulliken JB, Murray JE. Facial fractures in children: an analysis of 122 fractures in 109 patients. Plast Reconstr Surg. 1977 Jan. 59(1):15-20. [Medline]. Posnick JC, Wells M, Pron GE. Pediatric facial fractures: evolving patterns of treatment. J Oral Maxillofac Surg. 1993 Aug. 51(8):836-44; discussion 844-5. [Medline]. Smith DM, Bykowski MR, Cray JJ, et al. 215 mandible fractures in 120 children: demographics, treatment, outcomes, and early growth data. Plast Reconstr Surg. 2013 Jun. 131(6):1348-58. [Medline]. Myall RW. Management of mandibular fractures in children. Oral Maxillofac Surg Clin North Am. 2009 May. 21(2):197-201, vi. [Medline]. Cole P, Kaufman Y, Izaddoost S, Hatef DA, Hollier L. Principles of pediatric mandibular fracture management. Plast Reconstr Surg. 2009 Mar. 123(3):1022-4. [Medline]. Kushner GM, Tiwana PS. Fractures of the growing mandible. Atlas Oral Maxillofac Surg Clin North Am. 2009 Mar. 17(1):81-91. [Medline]. Goth S, Sawatari Y, Peleg M. Management of pediatric mandible fractures. J Craniofac Surg. 2012 Jan. 23(1):47-56. [Medline]. Pickrell BB, Serebrakian AT, Maricevich RS. Mandible Fractures. Semin Plast Surg. 2017 May. 31 (2):100-7. [Medline]. [Full Text]. Odom EB, Snyder-Warwick AK. Mandible Fracture Complications and Infection: The Influence of Demographics and Modifiable Factors. Plast Reconstr Surg. 2016 Aug. 138 (2):282e-9e. [Medline]. Shi J, Chen Z, Xu B. Causes and treatment of mandibular and condylar fractures in children and adolescents: a review of 104 cases. JAMA Otolaryngol Head Neck Surg. 2014 Mar. 140 (3):203-7. [Medline]. Khatri A, Kalra N. A conservative approach to pediatric mandibular fracture management: Outcome and advantages. Indian J Dent Res. 2011 Nov. 22(6):873-6. [Medline]. Hegab A. Management of mandibular fractures in children with a split acrylic splint: a case series. Br J Oral Maxillofac Surg. 2011 Dec 5. [Medline]. Eppley BL. Use of resorbable plates and screws in pediatric facial fractures. J Oral Maxillofac Surg. 2005 Mar. 63(3):385-91. [Medline]. Poore MC, Penna KJ. The use of resorbable hardware for fixation of pediatric mandible fracture. Case report. N Y State Dent J. 2008 Jun-Jul. 74(4):58-61. [Medline]. MacLennan WD. Consideration of 180 cases of typical fractures of the mandibular condylar process. Brit J Plast Surg. 1952. 5:122. Cascone P, Marra Marcozzi M, Ramieri V, Bosco G, Vellone V, Spallaccia F. Mandibular Condylar Fractures in Children: Morphofunctional Results After Treatment With External Fixation. J Craniofac Surg. 2017 Oct. 28 (7):1742-5. [Medline]. Landes CA, Day K, Glasl B, Ludwig B, Sader R, Kovács AF. Prospective evaluation of closed treatment of nondisplaced and nondislocated mandibular condyle fractures versus open reposition and rigid fixation of displaced and dislocated fractures in children. J Oral Maxillofac Surg. 2008 Jun. 66(6):1184-93. [Medline]. Tanaka N, Uchide N, Suzuki K. Maxillofacial fractures in children. J Craniomaxillofac Surg. 1993 Oct. 21(7):289-93. [Medline]. Imahara SD, Hopper RA, Wang J, Rivara FP, Klein MB. Patterns and outcomes of pediatric facial fractures in the United States: a survey of the National Trauma Data Bank. J Am Coll Surg. 2008 Nov. 207(5):710-6. [Medline]. Leake D, Doykos J 3d, Habal MB. Long-term follow-up of fractures of the mandibular condyle in children. Plast Reconstr Surg. 1971 Feb. 47(2):127-31. [Medline]. Norholt SE, Krishnan V, Sindet-Pedersen S. Pediatric condylar fractures: a long-term follow-up study of 55 patients. J Oral Maxillofac Surg. 1993 Dec. 51(12):1302-10. [Medline]. McGuirt WF, Salisbury PL 3d. Mandibular fractures. Their effect on growth and dentition. Arch Otolaryngol Head Neck Surg. 1987 Mar. 113(3):257-61. [Medline].